To make the 7–1 pattern work with Angular, a few modifications are needed. Here’s my take on it. Enjoy! and updated angular.json so that it looks for this new file. 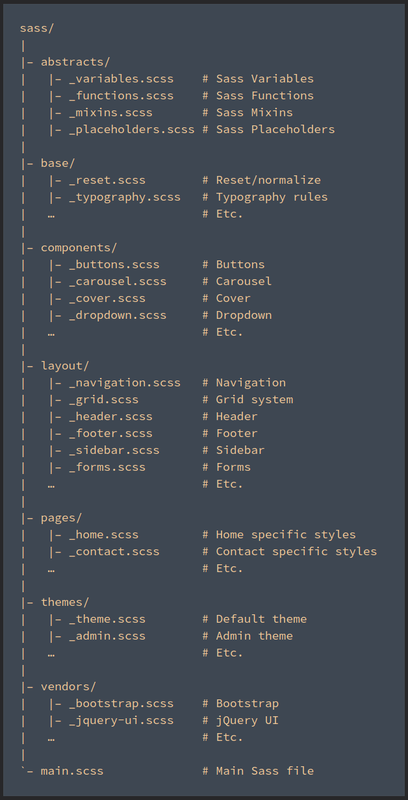 The components and pages folders are made redundant by Angular, because Angular generates stylesheets with each of its components. The vendors folder is also redundant, because external stylesheets (and scripts) should be included in angular.json. I created the remaining folders in the styles directory. and imported them in main.scss. I also added a shame file because I think it’s a great idea. A shame file is one where you put all the hacks you’re not proud of so that they don’t get lost and ignored. Having this file will encourage me to be honest about the hacks I write and make it easier for me to monitor my technical debt. 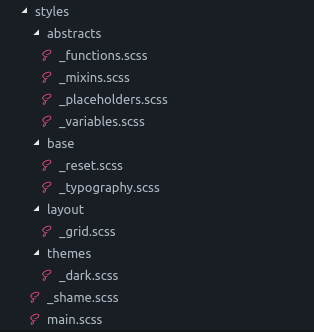 The import for the shame file goes at the bottom of main.scss . I’m not huge on relative paths, partly because they’re unaesthetic, but mostly because you can’t move your components around without updating your paths. Instead, I addedsrc/styles to the paths included by the sass preprocessor by modifying angular.json to include stylePreprocessorOptions . Thus concludes this afternoon’s adventure. If you’ve tried a similar thing and want to share what you learned, or if you have any suggestions to improve this architecture, feel free to leave a comment!